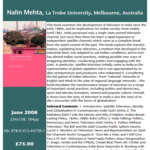 2nd edition: Delhi: Routledge, 2009.184 pages. In particular, satellite television initially came to India as the representative of global capitalism but it was appropriated by Indian entrepreneurs and producers who Indianized it. 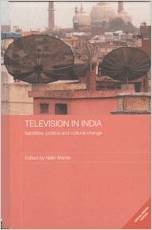 Considering the full gamut of Indian television – from “national” networks in English and Hindi to the state of regional language networks – this book elucidates the transformative impact of television on a range of important social practices, including politics and democracy, sport and identity formation, cinema and popular culture. Overall, it shows how the story of television in India is also the story of India’s encounter with the forces of globalisation.